What a joy – we had our first ever Art Student Exhibition the other weekend and it was a resounding success. At the beginning of the year, I thought it would be a good idea to hold such an event to give the art students something to aim for. Putting one’s artwork out into the public eye for the first time can feel like pinning yourself to the wall for all to see and then there’s the challenge of pricing the paintings. However, doing it as a group means it becomes a more fun activity with the constant support of others. Not only that, we raised money for our local Hospice. 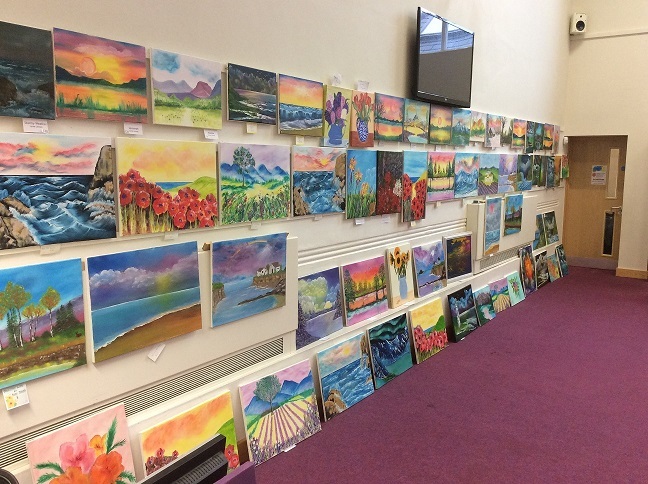 It was wonderful – the public bought 19 paintings and we sold all our homemade cakes, plus locally hand-crafted jewellery. As a community event involving the art students, The Hospice, The Salvation Army and the support of the Isle of Wight public, it really was very enjoyable so much so we’ve already got together and set a date for 2017. I now declare all the art students as artists in their own right!